I need to weigh in on something. And it may or may not resemble a rant. It’s not the most important thing going on in the world today, but it’s important to me, okay? I just finished reading Jen Hatmaker’s latest book For the Love (affiliate link). It’s hilarious and insightful and all the things you would expect from Jen Hatmaker. If you love Jen’s writing style, you should totally read it. I was so excited to see her book open with a chapter about balance. Obviously, because I love the subject of balance enough to devote nearly all of my writing efforts to it. She then goes on to explain why balance doesn’t exist. 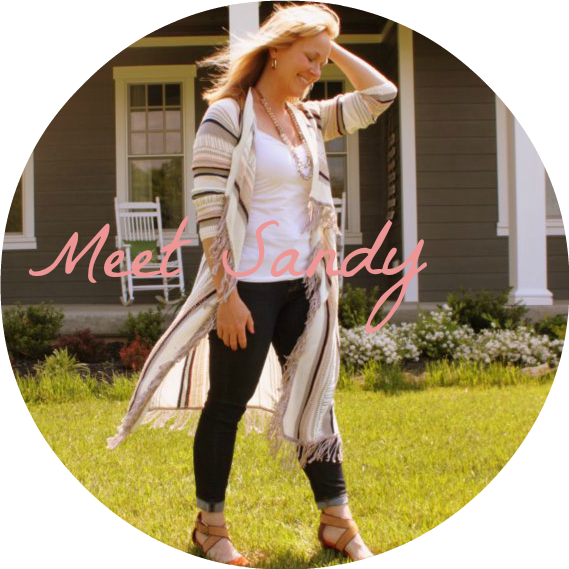 She explains how the standard to which we hold ourselves is impossible, she admits she has help running her home and business, and she encourages her readers to set boundaries and say “no” to maintain sanity. It truly is a great essay on the subject. I completely agree with everything she says. Since my blog is about balance, it would be safe for you to conclude that I believe balance is, in fact, a thing. Not only that, but I believe it is a worthy thing. We can and should try to live well-balanced lives. If I don’t believe that, then I’ve wasted years of my life writing about it. Balance is not doing everything. Balance is not doing everything your friends are doing. Balance is not doing everything your friends think YOU should be doing. Balance is not doing everything you see on Pinterest or Facebook or your social media venue of choice. Balance is not doing everything well. Balance is not doing everything alone, without help. Balance is not doing a little of everything every day. Balance is not spreading yourself equally among every person, task, responsibility and expectation. 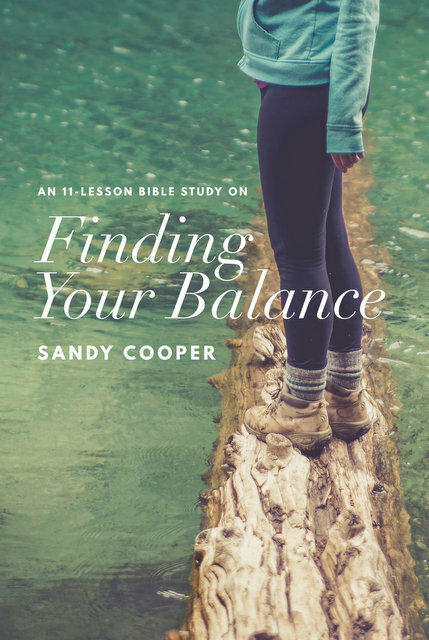 If you are pursuing any of the above things and calling it “Balance,” then I agree with the 50 million Google results, Jen Hatmaker, and all other people who think Balance is crap: Indeed, that is an exercise in futility. Balance, by that definition, does not exist. Please do not pursue it. You will fail. No matter how it appears, there is absolutely no person on the planet who does everything and does it well. No one. Without exception. Not even Beyonce. Find any person you believe does it all and does it all WELL, and I promise you, there is a catch. Either she has help or she lets something go that you make a priority. Probably both. I recently fell back into The Comparison Trap with writing. I was looking at bloggers who do some really cool things on their blogs, post several times a week, sell e-books and e-courses, record podcasts, submit content to other sites and continue to birth one published book after another. Many of them do all of this, plus travel and speak. And they raise kids. I started feeling discouraged and bad about myself that I can’t pull that off on my very best day, even when I devote hours a day to writing. As I dug a little further, I discovered that, without exception, either the blogger was extremely tech-savvy and could write her own code (I’m not even sure what that means), or the spouse also works full time on the blog (my husband doesn’t even read my blog most days) or she has a staff. A STAFF! As in a tech person and a virtual assistant and a person who handles marketing and social media. What?!! I’m not mad at the bloggers who have a staff or have a blogging spouse or are tech savvy, I just need to stop comparing myself to them. Literally, I’m sitting here beating myself up because I can’t do the same amount of work as an entire staff. It’s insane. This is precisely when we throw in the towel and believe balance doesn’t exist. It’s when we start with false assumptions, create a bad definition, and we try like heck to make our lives reflect it. That’s not balance. That’s just stupid. May I take a few minutes offer my thoughts (and hopefully some freedom!) about what real balance looks like? Balance is progress and growth over the course of time, rather than something to achieve perfectly each individual day. 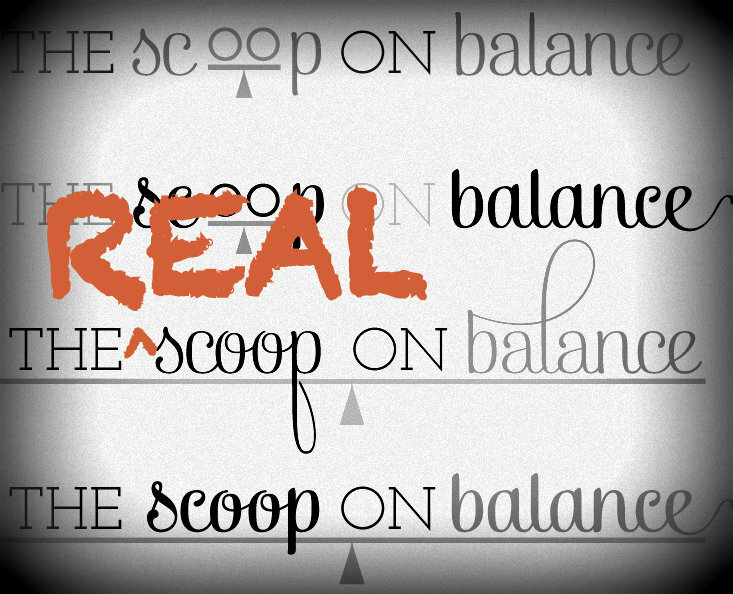 If you are growing emotionally, relationally, and spiritually, then you are pursuing balance. Balance is fluid and dynamic, as opposed to structured and scheduled. If you are adjusting your time to reflect your priorities of the day or the week or the season, then you are pursing balance. Balance is measured by levels of peace and joy instead of number of items crossed off the to-do list. If your laundry is piled to the ceiling, but your marriage is great and your kids are thriving, then, bravo! You’re also pursing balance. Balance is listening for God’s direction and doing what He says, when He says. If God tells you to drop everything and hold that baby for nine months straight, then, you, my friend, are pursuing balance. Balance is organizing your time in such a way that it reflects your priorities. Whether that means working outside the home or starting a non-profit or playing Legos on the floor with your 4-year-old, then you’re pursuing balance. Balance is eliminating time-suckers and life-suckers and exchanging them for things that feed your soul and the souls of those you love. It means simplifying and paring down to the most meaningful things. If you hire out the lawn service and the house cleaning so you can volunteer at the crisis pregnancy center, then so be it. If you decide to forego looking at Facebook so you can look at actual faces and read actual books, then YAY YOU! Balance! Balance is largely a by-product of gratitude. If circumstances have you in a tailspin, but you decide to extract a few good things from each day that you want to remember forever and ever, then you will have balance. Balance looks different for everyone. Knowing who you are, what season you are in, what you are good at and what you stink at are all keys to maintaining a well-balanced life. Whether that means quiet, slow days alone or loud, fast-paced days surrounded by people, only YOU KNOW YOU. And only you can decide what balance should look like for you. Balance is a thing, you guys. It may not be the thing you thought it was. But it’s definitely a thing. And this is all my opinion, because there are no absolute truths about balance. But I’m allowed to write about my opinion, because it’s my blog. “Balance is measured by levels of peace and joy instead of number of items crossed off the to-do list.” That is exactly how to measure it. You go, girl! Thank you! And you know I love me a good to-do list. But I don’t measure how balanced I am by the keeping of one. I believe you’ve beautifully nailed the reality of “balance”, as it pertains to the dynamic, interactive, fluid, flexible, morphing, continually developing and redeveloping roles each of us finds ourself in. Like you suggested, it seems we have to continually readjust the fulcrum under our balancing platform to reflect, and to better deal with, the different responsibilties for which we rely upon God to guide/steer us through, while in this present existance. Like you said, balance is a thing. Just like the peace that passes all understanding is a thing. When we don’t fret or have any anxiety about anything, but in every circumstance and in everything, by prayer and petition (definite requests), with thanksgiving, we continue to make our wants known to God, then God’s peace which transcends all understanding shall garrison and mount guard over our hearts and minds in Christ Jesus. Then we’ll be in balance, right? You are a blessing, Sandy. May God continue to bless you in all you do! I agree, Beth. For me, balance = peace. I totally get this. It’s like my friend who can’t stand all the “Love Yourself” messages everywhere. Including in some Christian media. She rants No Where In The Bible Does It Say Love Yourself! It Says Love God and Love Your Neighbor! She’s pretty passionate about it. But not all the messages are talking about the same self love that she’s talking about. The put yourself first and be selfish and look out for number one self love. Lots are talking about taking care of your physical and mental and spiritual health so you can be everything you can to those who need you and the work God calls you to. Which is ironic, cause my friend – she’s really good at that. She gets up early to spend time with God, knows her limits and knows when she needs a break, eats well and discusses her mental health regularly with her doctor. She’s great at that definition of self love. With all messages everywhere all the time, we need to be careful how the writer/blogger/poster/talker/etc is defining the topic vs how we define it. It can totally change the meaning of what we are hearing. I’ve been thinking about the “Love Yourself” message ever since I read this comment. The Bible says in Mark 12:30-31 “Love the Lord your God with all your heart and with all your soul and with all your mind and with all your strength.’[a] 31 The second is this: ‘Love your neighbor as yourself.’[b] There is no commandment greater than these.” Just my opinion, but the “as yourself” part of that commandment implies that we need to love ourselves. But I agree with your friend that, much like the concept of balance, it is not explicitly stated and we can only infer it from the larger themes in scripture.